Marc Munafo, the President of CAM Construction has been a leader in the industry to reach out to MBE Firms. As Chairman of the Associated Builders and Contractors (ABC), Marc championed diversity within the organization. He authored and chaired the ABC Leadership Conference where diversity highlighted the agenda. Marc also participated in a round table forum with the Maryland Minority Contractors Association focused on extending outreach to the minority community. CAM maintains a current roster of MBE firms certified by the Maryland Department of Transportation (MDOT) and the City of Baltimore, and updates that listing regularly by visiting the web based directories. CAM actively solicits bids from registered firms for all projects bid or constructed by the company. Functioning in an open book environment, CAM Construction continues its policy of seeking comprehensive quotations from any and all financially sound, qualified firms regardless of their status of minority ownership. CAM’s dedication is evidenced by results. Over the past 10 years the company has awarded over $100 million in contracts to MBE firms. CAM routinely commits to exceed its specific MBE project goals. In fact a sampling of the company’s recent projects revealed the MBE goals were exceeded on average by 10%. Even in the absence of a goal as in the construction of the New Psalmist Baptist Church, CAM actively sought MBE contractors achieving 42% participation, resulting in close to $15 million in contracts. This dedication to the community was recognized by the receipt of the Best Practices Award by the MD Minority Contractors Association and The Bridging the Gap award from the Greater Baltimore Committee. Honors minority-owned and women-owned firms for achievement and others for their efforts to strengthen minority business development. 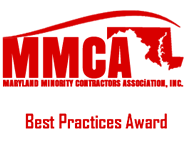 This award presented by the Maryland Minority Contractors Association Inc. honors contractors who display exemplary performance in reaching out to minority and women owned business.